To capture a city is very simple, you just need to have at least 300 crew more than the city, when you start to fence it. Always have all vets when fencing a city. The more crew you have, more than the city, the less risk of the governor running away and hiding and preventing you from capturing. There is a big different between capturing an npc city or a city owned by someone else, when shooting at it. You need shatter ammunition, to kill soldiers in a city and team level 11 for more firepower. Learn all about team here. 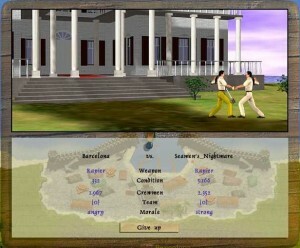 The npc city will keep adding soldiers, as you shoot and it is not possible to kills all soldiers in an npc city. Small cities you can shoot down to about 600 soldiers and cities with forts to about 1000 soldiers. 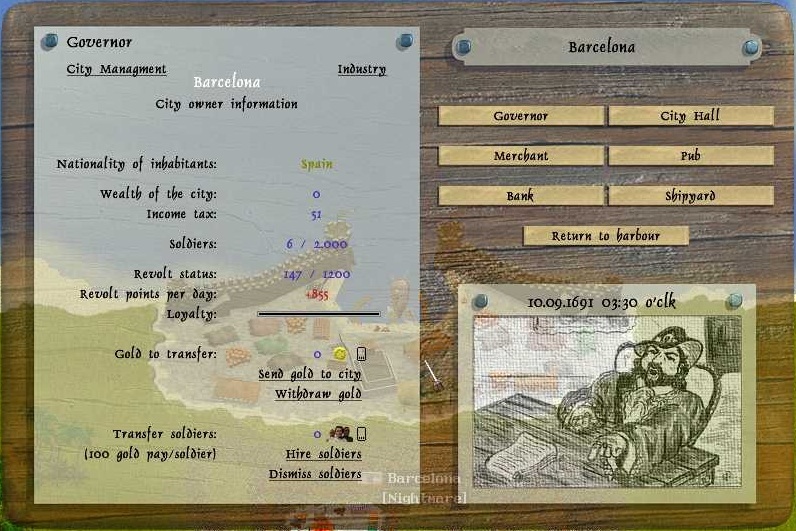 A city owned by a player will not add soldiers, unless the player is in the city, to add them. 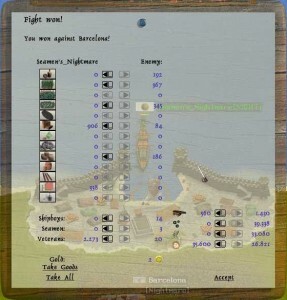 You can find a list of all cities owned by players, on the high score list here. You can see the amount of soldiers in the city, when you are in the city and look to the left under cast off. The little house indicate population, this is not how many soldiers the city have. The gold coin show if the city is poor or rich. The swords, indicates how many soldiers the city have. The cannon shows, if the city has none, city wall, 1 fort or 2 forts. When you are ready to fence the city, you have to be on fence mode and safety off and ram the city between the two small towers at the harbor entrance. Do not forget, you need team level 12 for team mates to help in fence. Learn all about team here. Now you will get an option to choose weapon, rapier is recommended. You can also offer retreat, but it is random if you will get it. You can also start fight right away. When you start the fence, it is just like fencing an npc ship. Learn all about fencing here. 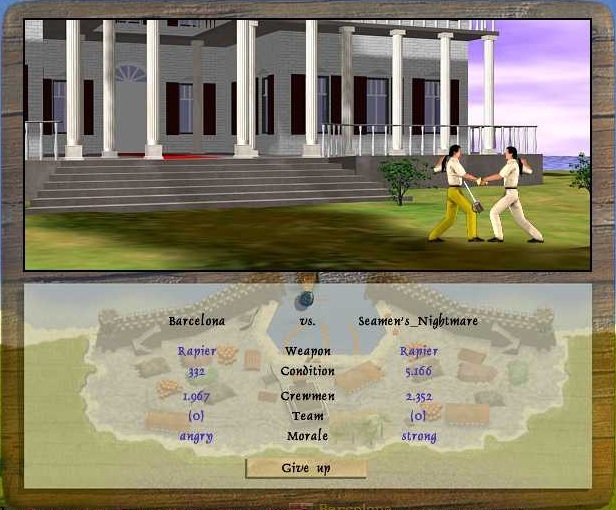 It is also now team mates can join in, to add more crew to help you. 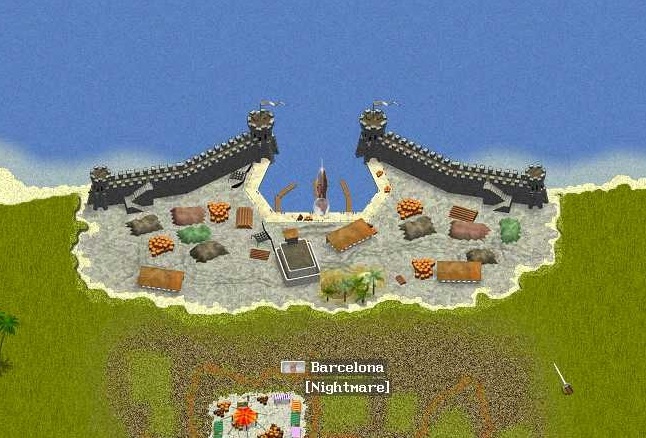 They also need to be on fence mode with safety off and ram the city between the 2 towers. Do not forget, you need team level 12 to team fence a city. If you lose, the city takes your flagship, but you will be able to buy it back in the shipyard for short time. When you capture the city, you will get an option to change the nation, you cannot choose the nation it already is and if you just press close, it will be the preselected nation. No matter if you captured the city and changed the nation or if the governor ran away to hide, you will get option to plunder the city. 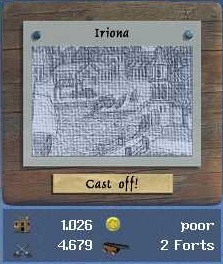 You can take goods and weapons and you can also see how much gold you got from the city. All captured gold is shared in the team, if you are in one. If you captured the city it will now have the nation you choose and if you are in a clan, the clan name will be under the city name. City will have shield for a real time hour, after it was plundered. 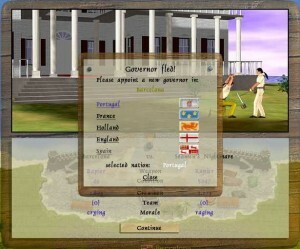 Now you are the governor and if you go into the city and look under governor you will now have some new options. At top you can see the original nation of the city. Wealth of the city, is the gold that pays for soldiers, if you are in a clan the clan bank pays for soldiers. Income tax is the gold the city makes for you and you can withdraw this gold. At soldiers you can see how many the city got and how many maximum soldiers it can have. 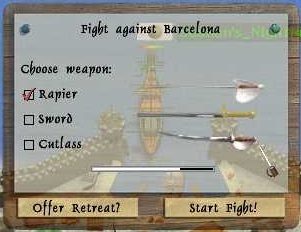 Revolt status shows how many points the city is away from revolting and turning into an npc city. Revolt points per day, is how many points are added per wop day. When red it will soon revolt and if green it is becoming loyal. At loyalty you can see on the line if the city is loyal, when the line is all white the city is loyal and do not need soldiers to stay yours. 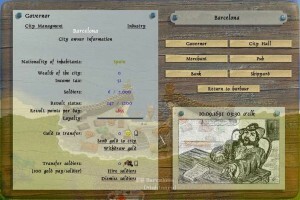 Gold to transfer, is where you take out gold the city earned or add gold to pay for soldiers, if you are not in a clan. Transfer soldiers, is where you hire or dismiss soldiers, it is recommended to have 100 soldiers or more, in the city to prevent it from revolting. Note that hiring soldiers will cost you gold, no matter if you are in a clan or not.